Coco Premium consists of pure high-quality desiccated coconut husk (coir), making it a reliable and easy to use substrate for hydroponic systems. The RHP certification ensures that the coir maintains a high level of consistency and quality, is pest and disease free, thoroughly rinsed, pH stabilised, pre-buffered with calcium, and has a low salt index. Additionally, Coco Premium has an excellent capacity for liquid retention and is extremely friable. Coco Premium is an ideal substrate to ensure that nutrients are present and available during plant growth. In its natural state, coco (coconut husk) is saturated with sodium ions as the coconut trees are grown near sea water which is high in sodium chloride (sea salt). Plants are sensitive to sodium, which can cause stress and impair nutrient uptake. Incorrect pH levels can also cause plant stress due to impaired nutrient bioavailability, which is commonly referred to as ‘nutrient lockout’. Thus, Nutrifield Coco Premium is thoroughly washed and flushed with calcium to remove sodium and stabilise pH levels. Additionally, Nutrifield Coco substrates have been awarded the coveted Dutch RHP certification, an international indication of high quality. The RHP certification assures that the coco is clean, consistent, and free of pests and pathogens. 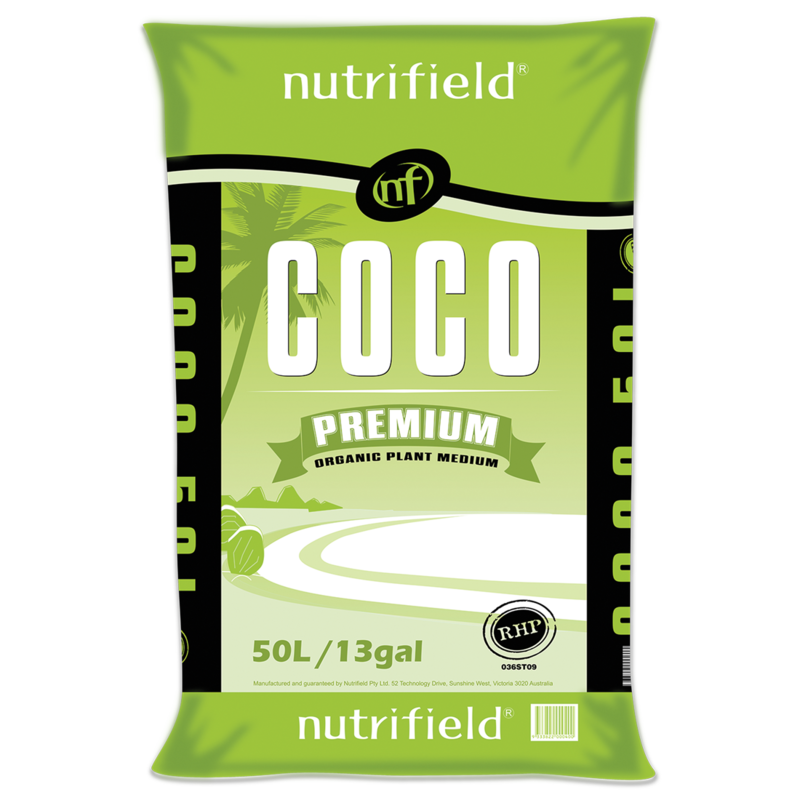 Nutrifield Coco Premium is friable, has a high capacity for water retention, and is inert. This ensures that nutrient solutions are efficiently absorbed and remain near the root zone with an unaltered nutrient profile.The coir supports the growth of beneficial microbes, such as Trichoderma, which compete with disease causing pathogens and improve nutrient bioavailability, thereby promoting robust plant growth.